Rotowash has a wealth of long serving customers in the food production and preparation industry and understands the importance of sanitation and safety in cooking and food preparation areas. 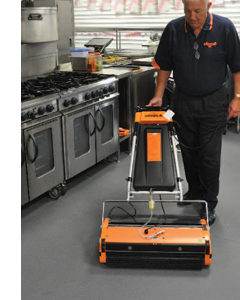 Our machines effectively and thoroughly clean concrete, tiles, resin as well as slip resistant other loose floor coverings, allowing you to work safely in your kitchen. Rotowash floor cleaners are recommended for cleaning anti-slip by Altro, Gerflor, James Halstead, Marley and many other major flooring manufacturers.